My family were friends with a couple growing up who would host the best parties. They had amazing Halloween parties, but I especially loved their 4th of July parties! Their names were Goldie and Jack. I mean come on now the lady's name is Goldie, she had to be awesome! Anyways, they'd have a big BBQ, a huge pool, endless bins of toys (that you could take home!!! ), and we got light sparklers at the end of the night. These parties were the highlight of my summer. I since moved away from home, and I think these parties continue without me now :(. However, whenever July 4th rolls around I'm remidned of Goldie's amazing parties! In honor of 4th of July I have an awesome indie limited edition polish to show you by See Sarah Swatch's store Two Birds One Store. 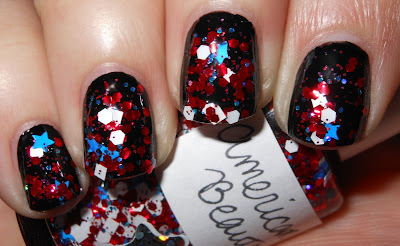 American Beauty is a mixture of varying sizes of hex red, white, blue, and blue star glitters in a clear base. Isn't this an awesome polish?!? It's like a firework exploded on your nails. I love the variation of sizes of glitters, it gives this glitter polish so much dimension and character. It completely and utterly rocks. I'm hoping this polish lasts on my nails all week because I don't want to take it off! The sad part about this polish is it was limited edition, and I got picked off very quickly. I saw it and swooped it instantly. I'm certainly glad I did! Thats a gorgeous polish, happy fourth of July! love that glitter! its fab. those parties do sound amazing!! What % of retail price do wholesalers usually get? I want to sell my product to a chain of paint stores. ?